I read A Knight of the Seven Kingdoms for the N.E.W.T.s read-a-thon, I needed something by an author I like and wasn’t all too long. It was as much fun to read these three short stories as it was the rest of A Song of Ice and Fire. I give A Knight of the Seven Kingdoms by George R.R. Martin four out of five hearts because these are very cute stories in a world I already knew. Dunk starts out as a hedge knight and over the course of the three short stories grows into his own and a real knight. It was nice to hear some of the familiar names of A Song of Ice and Fire, but they mostly have nothing to do with each other because there is so much time between the two series. 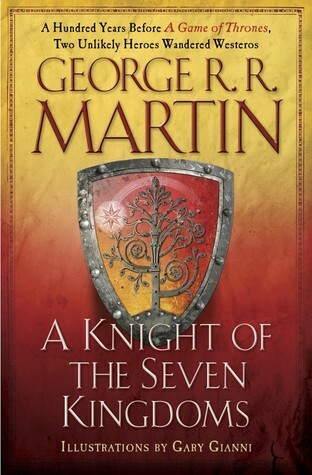 If you like A Song of Ice and Fire, go ahead and read A Knight of the Seven Kingdoms. If you have never read the main series, still read this. They are short stories, pretty fun and well written. This entry was posted in Book Review and tagged Adventure, Book Review, Drama, Fantasy, George R.R. Martin, Humor. Bookmark the permalink.